On March 13, 2006, the Cassini spacecraft’s narrow-angle camera captured this look at Saturn and its rings, seen here nearly edge on. The frame also features Mimas and tiny Janus (above the rings), and Tethys (below the rings). “Above” and “below” the rings is mostly a matter of perspective here. 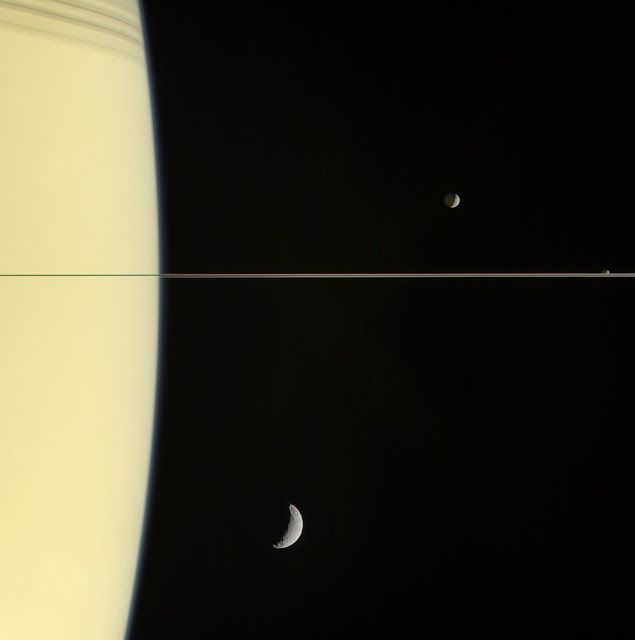 All three moons and the rings orbit Saturn in roughly the same plane. The night side of Mimas is gently illuminated by “Saturnshine,” sunlight reflected from the planet’s cloud tops.